Born to Be Blue is one of the true classics of our time. Following the story of Chet Baker, a famous trumpet-playing blues artist struggling to put his heroin-shattered life back together, it is a marvel of acting, writing and directing, and a masterpiece of cinematography. The film pulls no punches, knocking you off balance early on with an abrupt flash-forward, and letting you relax again only long enough to pull the rug away once more. By destroying your trust in its pacing right away, Born to Be Blue places you in the same cautious, vulnerable shoes as its protagonist. This isn’t to say that Chet’s character is at all wishy-washy. Rather, Ethan Hawke will win your respect not just with his outstanding performance, but for the character he portrays. Hawke’s Chet is as brave as he is vulnerable, as cocky as he is talented, and as relatable as they come. An underdog tale at its heart, you can’t help cheering for Chet as he struggles with even the most basic of life’s necessities. You root for his love life not only because of his livewire chemistry with Carmen Ejogo, but because the guy deserves a break. Yet, every time things seem to be going well for him, the tension only grows as the film moves toward its climax, with the ghost of Chet’s addiction dogging every step. Flashing back and forth between Chet’s present and past, the movie uses jump cuts and shifts from black and white to colour. This combination with well-timed use of zoom and close ups not only mimics the chaos and instability of Baker’s life, it also offers a gritty and stunningly intimate glimpse into his very soul. 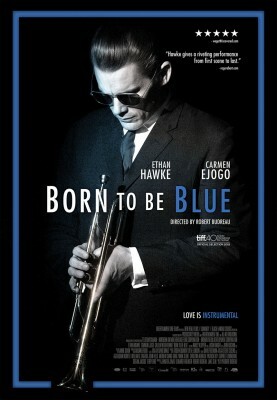 Born to be Blue is not a movie which merely entertains. It transforms you, pulling you into the life and world of its subject, and letting you experience the artist’s joy, pain, and triumph. You will laugh and cry with him, and more than anything you will feel the weight of his struggle. A disquietingly honest film, this movie’s battles are not fought with fists or even words, they are the decisions Chet faces. And as the movie draws you forward onto the edge of your seat, all you can do is hold your breath and hope he makes the right ones. This movie will break your heart and steal your breath, but you should let it.